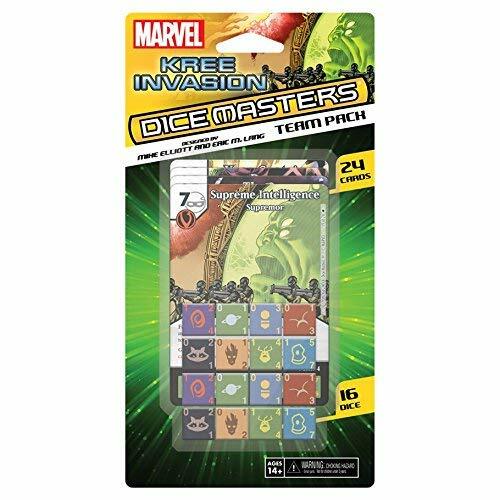 Kree Invasion Dice Masters Team Pack Explored — GamingWithSwag.com - Dads By Day, Gamers By Night. Wizkids is dropping some sweet Dicemasters team packs to coincide with the Avengers Infinity Campaign box release and the Kree Invasion pack (the other features the Thunderbolts) has the most Infinity War overlap with the majority of the other Guardians of the Galaxy and the big man himself, Thanos. The main campaign box is a little light on villains but buying this set can fix that problem up pretty well. This set will likely tie in nicely to a future Captain Marvel set since we know her upcoming movie is likely to involve the Kree. Like past releases you only get two dice for each character so if you want to utilize four dice for anyone you need to purchase the pack twice and with some cards built on the "Swarm" ability you will certainly want to double up if you are making competition decks. Below I will give some initial thoughts on the cards in the set and you can decide if you can't live without these in your life. I accidentally cut the defense off Groot which is 2,6, and 7. Drax is a bit strong for a 3 cost, but has a fielding cost that can slow down your early ramp economy which is why the abilities that make it possible to field him for free handy. And late in the game he won't be a disappointing cheap character to draw when you are hunting for more powerful dice. Groot has a great global for a team based build to cycle your favorite dice, and if you play a hodge podge of cards you can always love having Regenerate. However, I hate that level 1 Groot and might bring him to a game for his global more than his dice. The Swarm ability worked really well in the Dungeons and Dragons sets, and having more in the Marvel world is nice and really helps boost villain decks. I wish the Fist energy synergy was more useful in this team pack as the big villains are both Mask based. Mantis isn't amazing unless you go all out on Guardians, although I think the "This One Knows" card could be great on occasion. Rocket is the hammer in a Guardians deck and with the low defense you will want 4 of him to throw at your opponent. Thanos is a beast and has my beloved Overcrush on two of his cards. He might be my favorite new card in the new Marvel sets. Supreme Intelligence works great with swarming mechanics and those Kree goons assuming you also grab a Fist villain to add to your team. This pack is great, and even if you don't buy the Campaign Box I think this could be a decent option, but if you read this far you already know you are buying this and building a Guardians team and trying to find ways to unleash Thanos on your friends.